Cadbury's Glass and a Half Full Productions comes up empty with this visually lush but oddly soulless 90-second spot filmed in China by Ogilvy Johannesburg. It features a monastery of wacky dancin' monks, lots of purple balloons, and one helium-sucking holy man who really should've taken a vow of silence. Injecting goofball shenanigans into a quasi-mystical setting yields an East-West disconnect that's ultimately so crass and vapid, it's painful to watch. Even worse, the ad seems to want to say something profound, but there's no chance of making a meaningful point with this kind of set-up. Once the brothers bust their moves, a full-throttle WTF finish is required. Cameos by the drumming gorilla or the eyebrow kids might've added some welcome self-reflective absurdity and saved the day. Instead, we get a pretentious shot of balloons filling the sky. 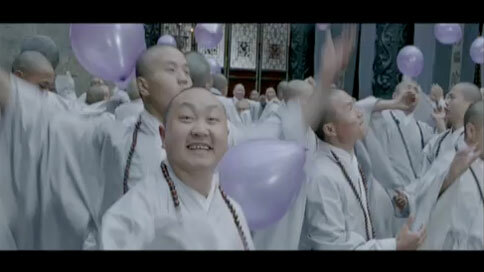 They symbolize nothing, and leave "Monks" twisting in the wind without a prayer.